Energy is what has manifested itself in the various forms of life on Earth and whatever exists in this universe. This is what living beings strive for and non-living things are made up of. 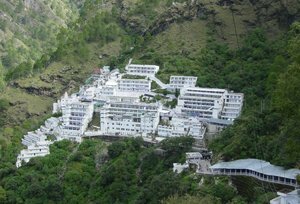 It is only natural that mere mortals get engaged in worshipping 'Shakti' as they deem fit, and Maa Vaishno Devi at Trikut Parvat is one of the most prominent of the places where devotees of Divine Mother of all the energies of cosmos is revered and venerated. 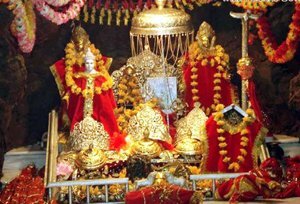 The temple of Maa Vaishno Devi in Katra located in Jammu region of the northern most state of Jammu & Kashmir (J&K) could be reached only after strenuous uphill trek covering 12 Km distance. Most of the devotees prefer the pedestrian way, on the road to 'darbar' or taking the stairs. People suffering from old age, physical ailments / handicap or any other issue can take 'palkies' carried by four men or on ponies / horses. During Navratri festival of 9 days held twice in the year - March-April and September-November as per the auspicious 'tithi' days, it gets most crowded but the devotion rings through all the more. The cave which enshrines the three holy 'pindis' - stone representation of the three form of Energy - 'Guna'- Satva, Tama and Raja, which are Mata Mahasaraswati, Mata Mahakali and Mata Mahalakshmi respectively. Although the source rock of pindis is one, they all differ in color and texture, said to be denoting the color of the goddesses they represent - slightly white for Mother Saraswati to the extreme left; to the right is black of Mother Kali, and in the middle is yellowish red of Mother Lakshmi. The age of the cave is undoubtedly millions of years though the reference of the Goddess could not be found in age old Hindu scriptures of Puranas. The oldest reference to the Shakti is said to be found in Mahabharata, when Lord Krishna asks Arjuna to invoke the Goddess and he did, referring to 'a goddess staying in the temple on the mountain slopes of Jamboo'. Moreover, the five stones in the mountain temple adjacent to the Trikuta hill are believed to be symbolizing each of the Pandavas. The temple in present day is served by the descendents of Pandit Shree Dhar, and with him is attached the story of appearance of human form of Shakti in Maa Vaishnavi as young girl. Shreedhar was devout to Ma and arranged for a huge 'Bhandara' - luncheon in the name of Maa as per the wish of the Goddess in the girl. A Tantrik named Bhairav saw the mysterious powers of the girl and tried to get hold of Her, which She escaped but not for long. On the way, She shot an arrow from where a fountain of water came out masking Her presence. The water is present in the form of 'Baan-Ganga' (Baan means arrow). She then resided in the cave known as Gabha Gufa and meditated for nine months until Bhairav found Her. She then took form of Goddess Kali and beheaded him. But, She knew that the tantric was seeking her only to attain salvation, She granted his last wish and the boon of his shrine being visited by Her devotees as a completion ritual of Maa Vaishno Devi Yatra. Shreedhar on the other hand dreamt of Maa being present in the cave, followed his instincts and reached there. Since then, the priests serving the temple are of his lineage serving Maa Vaishnavi having taken the form of three pindis. By Air: The nearest airport to the place is located in Jammu, others being New Delhi, Srinagar and Leh. From here onwards taxis could be hired to Katra, 50 Km away from the airport. Helicopter services to 'Mata Rani darbar' are also available that require pre-booking. By Train: Jammu is well connected to major India cities like New Delhi, Chennai, Pune, etc, by trains. Others can take route via Delhi. By Road: Bus services are available from various cities of India like New Delhi, Chandigarh, etc; others might have to change buses at a point in their journey.